Height of a person is the distance from the bottom of the feet to the top of the head while standing erect. The average height of the people usually depends on ethnic group and gender. In average men are taller then women. 2.57 m (8’5") tall Leonid Stadnyk of Ukraine, is believed to be the world’s tallest living man. Stadnyk’s height is disputed because of his refusal to be measured. 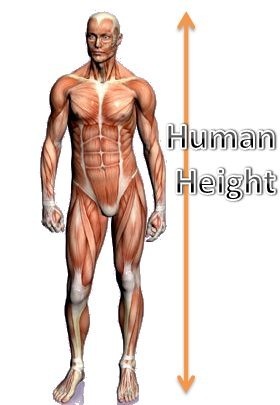 So, the official tallest man is 10 cm shorter – Sultan Kösen, of Turkey is only 2.47m (8’1") in height. These tallest people are some of the only twelve individuals in medical history, to be confirmed eight feet or more. The tallest man in the modern history was a 2.72 m (8’11") man from Illinois, US, Robert Pershing Wadlow (1918–1940). 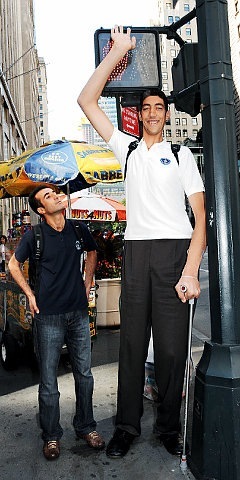 The 26 year old current tallest man in the world, Sultan Kosen, from Turkey. The record holder had never stepped on foreign soil until he went to London to mark the launch of the Guinness World Records 2010 edition in September, 2009. Having four normal sized brothers and sisters, started growing in alarming rate due to a tumor that caused too much hormone to be released from pituitary gland. It is a relief that he won’t grow any further after the tumor was successfully removed last year. Sultan also has the world’s largest hands and largest feet. His hands measure 27.5 cm (10.8′) and feets measure 36.5 cm (14.4′). This entry was posted in Love n Life, Records and tagged Leonid Stadnyk, Sultan Kosen, Tallest, Tallest men. Bookmark the permalink.